Pay tribute to your favorite metropolis with these stylish, modern porcelain plates featuring each city's downtown core printed on a black background. Key buildings are represented with red icons, while rivers and public spaces are shown in blue and green. Comes gift-boxed with a printed key. The blanks are made in Poland and fired in the USA. Click to see details of Chicago, Berlin, Las Vegas, London, Los Angeles, New Orleans, New York, Paris, Rome, Shanghai, Tokyo, and Washington D.C. This item has been discontinued. When it sells out, it will no longer be available. At this time, only Shanghai is available. Bought this as a gift for my sister who lives in Chicago. I know she's going to love it! I just wish they had more cities, like Boston, for myself. If you know Chicago, there is a seamless reflective bean in one of the parks...on the plate they have the tiniest bean to represent it! I love it! Wasn't certain about the quality of the product before ordering, but wasn't disappointed when it arrived. It made the perfect gift. This series of plates is beautiful and functional, although we will probably not be eating off of it. This year my husband turns 50. I have known for about 6 months that I want to surprise him w/a trip to Washington D.C. Since I have been a frequent Uncommon Goods customer for 11 years now, I get their catalogs in the mail. One day while looking through their catalog, I saw the Washington D.C. city plate. I am going to wrap up the plate and have my husband open it. I thought it would be a perfect way to present him with his trip to D.C. Plus, he'll have a keepsake to hang on the wall. The gift went over well. It was sent to a friend in the DC area. It was trendy and not touristy in looks. Beautiful. Would like other cities. A great decorative piece that received a lot of compliments. I wish other cities like San Francisco or Boston would be featured. These unusual plates were for a wedding gift because I could select the ones that depicted places the bride wants to live in someday. One of the plates even gave some of the proceeds to rebuild a park! Everyone has favorite cities, so you can make your gift have a personal slant. These dishes are so hip, that I'm thinking of buying some for myself. We bought this as a gift for a friend for his wedding since he'd met his fiance in Washington DC. The design looked pretty cool on-line, but when we got the plate in the mail, it was exceptionally cool. I really liked the legend key that was included. Great gift idea. Don't know if they actually use it as a plate, but I think it makes for a good conversation piece when hung on a wall. perfect gift for a city friend! this was a gift that has yet to be opened by a good friend who lives in the city of Chicago - loves Chicago - I used to live in the suburbs - now on Sanibel Island so I view city life differently - for me the plate is the perfect present! 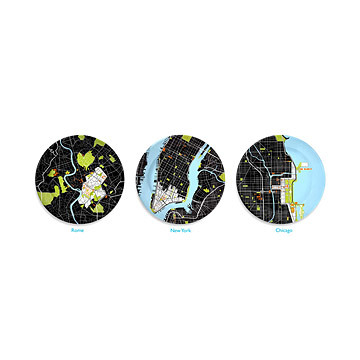 Pay tribute to your favorite metropolis with these stylish, modern porcelain plates featuring each city's downtown core printed on a black background.